The younger me tuned into the Food Network and consumed shows such as Pitchin’ In, which enlightened me about the many food purveyors throughout Canada – not the constant barrage of “competitions” that now plagues the station. With every episode, I started liking Chef Lynn Crawford’s laid back funny attitude even more; I want to travel with her and eat her creations … oh why can’t we be friends? 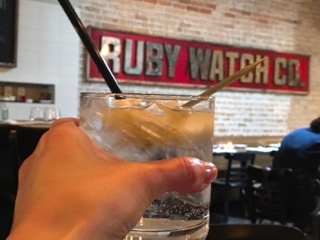 As luck with have it, Torontonians can experience her cooking at Ruby Watchco. Together with Chef Lora Kirk, they create a menu that changes daily and is truly a tasting menu ($54) as there’s only one option – take it or leave it. With the appetizer and main course, the restaurant does offer add on items (a chicken liver parfait and bacon sliders, during our visit), so if you truly detest one of the dishes, you can leave more for your guests and buy something else. However, if you’re not a picky eater or tend to be indecisive and agonize over all the choices, this is the restaurant for you. 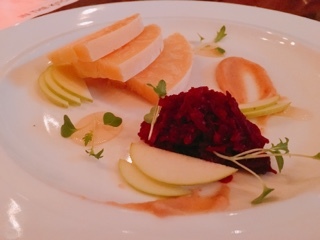 Although a wine pairing is available ($39), if you’re visiting on Tuesday to Friday before 7pm, there are drink specials available including $5 cocktails, $5 beers, and $8 wine (including a bubbly option)! Cheers to that! 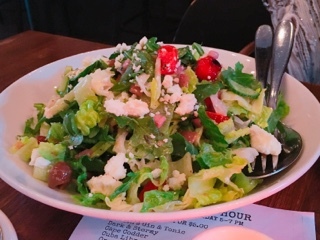 With the exception of dessert, the dinner’s served family style and on this evening consisted of a large bowl of Ruby’s Greek style salad. For me, a salad seems like such a boring start. But, the thick creamy pickled jalapeno aioli on the bottom, turned the typical greens, tomatoes, olives and feta into a dish that I had seconds of. 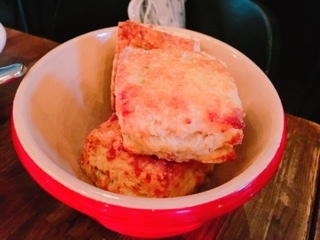 After demolishing the hot salty cheddar buttermilk biscuit, of course. Where are your priorities? 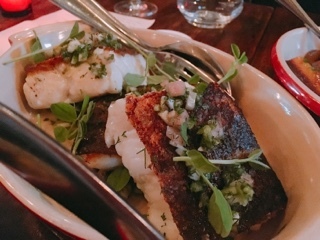 Make sure to leave room for the main, the thick piece of Fogo Island cod was cooked perfectly, remaining moist and flaky with the requisite crispy skin. The slightly spicy and refreshing green onion relish helped add tons of flavour to the neutral fish. So good, I bet it’s a main that even people who normally don’t like fish would enjoy. 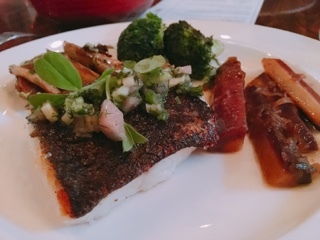 I commend the kitchen for their perfect timing on the vegetables: the sweet heirloom carrots just starting to soften and meld into the aromatic leek marmalade; the lightly charred broccoli incorporating a bit of smoke, yet still fresh and crunchy; and the fingerling potatoes cooked through but firm enough that the starchy creaminess remains. This evening, Ruby Watchco showcased the Big Brother cheese from Lancaster Ontario’s Glengarry Fine Cheese. A firmer varietal, it was accurately described as a cross between parmesan and cheddar. The Big Brother is relatively mild and reminds me of a younger Beemster – a semi-firm texture, slight formation of crystals, and smooth finish. After dining at Ruby Watchco, I can see how Chef Lynn’s creations on air translates into the restaurant. The menu sticks with the tried and true favourites – a chocolate cake to finish – and elevates the recipe with tasty, non-fussy finishes. 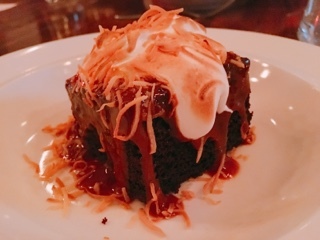 Dark chocolate and espresso is incorporated into the cake’s batter to balance out the caramel sauce and sweet meringue topping. As you enjoy the moist cake, there are so many flavours and textures that start to peek through … and just like that, the dessert’s done. Ruby Watchco gets polarizing reviews - you either love it or hate it. 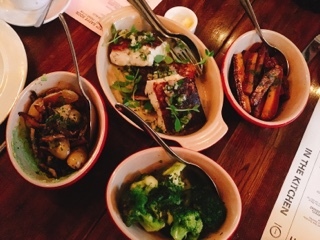 Not knowing what you’ll be eating until the week of is either exciting or an annoyance; and being served family style either means getting more of what you like or more work. It’s not a restaurant for everybody. For me, I have an opened mind and opened stomach, hence, it’s a meal I thoroughly enjoyed. Now Chef Lynn: can we be friends?